Kids on the streets, almost without clothes no matter if it’s hot or cold, asking for some money to buy something to eat. This is a typical image of Latin America and in Brazil that has become the most visible in recent years. The report “Scenario of Childhood and Adolescence in Brazil” published by the NGO Fundación Abrinq shows that more than 40% of children live in poverty, of which 5.8 million live in extreme misery and 4 million more in favelas (neighbourhoods in emergency situations). Almost 70% of children from 0 up to 3 years-old do not have access to public or private day-care centres; and 1.6 million students between 15 and 17 years-old drop out of school. Poverty and family violence accompany these alarming numbers, leaving children in a situation of extreme vulnerability when it comes to crime. 70% of the murdered youths are black, poor and living in the periphery. Many of them have already used inhalants, marijuana, cocaine and other drugs despite their young age (Pan-American Journal of Public Health, 2018). Brazil is currently experiencing a deep political, social and economic crisis. The situation began to get worse when the opposition parties asked the Brazilian Congress to start a political trial against former President Dilma Rousseff. The accusations against the president included alleged violations of the country’s tax laws and the manipulation of public finances to benefit her re-election in 2014. The crisis then moved to the streets, where thousands of people protest daily against the political and economic discontent that crosses the country. With an unstable currency and alarming numbers that reveal growing social inequality, poverty is not the only problem to deal with in Brazil. In this context of crisis there is the phenomenon known as “social cleansing”, which refers to homicides in public places with victims being beaten or killed in the streets. Police groups simply enter a community in vehicles called “caveirão” and open fire. These types of actions are called “efforts against the marginal classes”, a phenomenon finds its causes in economic and social factors (Wilding, 2010). Children are also victims of sexual violence. According to the WHO (World Health Organization), between 50,000 and 100,000 children are affected by HIV. It sexual attackers are mostly drug traffickers and in some cases the police was involved too during this “social cleansing” process in the favelas with four to five children to be killed daily, two of them only in Rio de Janeiro (Pan-American Journal of Public Health, 2018). Since January 2018, crime has increased by 39% because of the “police brigades of death” known as during one of the bloodiest periods in Brazil. Some other killings are a result of groups attempting to punish criminals for misdemeanours, others are a result of perceived threats to poor citizens. 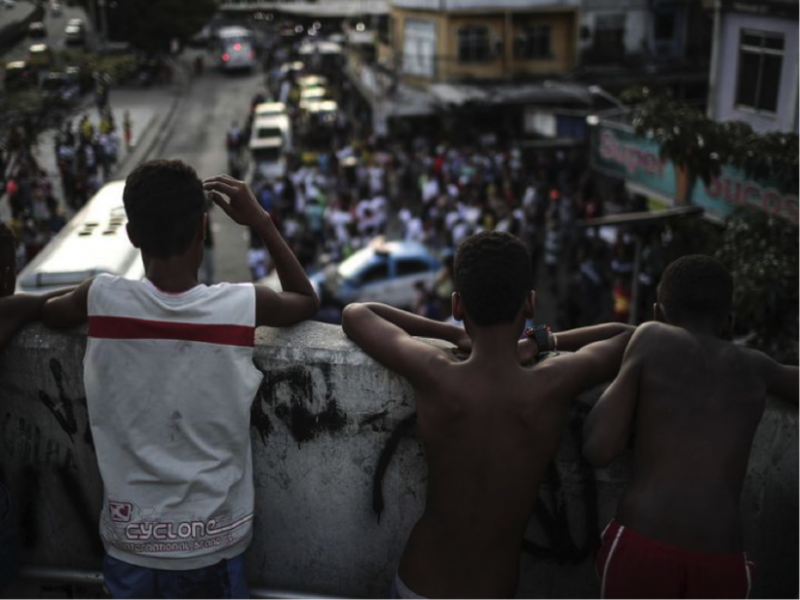 In June, the military police opened fire without announcing same in the neighbourhood of Maré (Rio de Janeiro), where 14-year-old Marcos Venício Da Silva was shot. Before dying, little Marcos asked his mother, “if the police did not see that he was wearing his school uniform”. According to data supplied by the Brazilian Public Security Forum, in 2017 alone 63,880 homicides were committed, which represents 175 victims per day, 7 per hour. Although statistics have been reduced in certain states, there are some other 12 states in the north and northeast of the country where number of crimes have increased. 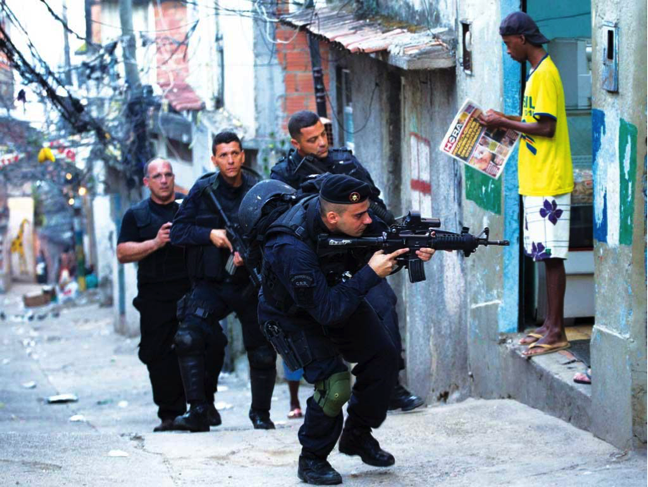 It can be said that a large number of homicides are due to actions designed by the military police to end criminality in the favelas. So far, the effort of the government to end crime and violence in the favelas has been scarce and not enough. According to the World Bank, Brazil has the highest gross national product in Latin America with US $ 2,009 per capita, its economy is the tenth largest in the world, but one of the most unbalanced worldwide. The government has invested in boarding schools and rehabilitation for children, but giving in turn more authority to the military police to open fire in any situation. As social inequality increases, the lives of many children in Brazil remain at risk, where hunger, drug trafficking, violence and abuse lead to crime or death. The future of the children remain uncertain. Humanium has been working for 10 years to put an end to violence and abuse against children, raising awareness amongst both, adults and children and together concretise the rights of the most defenceless of the society. Visit our website https://www.humanium.org/en to learn more about the rights of children and our projects, to contact the Humanium team and to get involved, at our side, in order to improve the lives of thousands of children around the world. Wilding, Polly. (2010). “‘New Violence’: Silencing Women’s Experiences in the Favelas of Brazil.” Journal of Latin American Studies. Published on November 2010.